Singapore Airlines today welcomed the world’s first 787-10 aircraft as it arrived in Singapore from Boeing’s production facility in North Charleston, South Carolina. 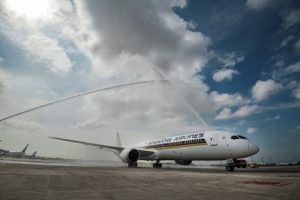 “The 787-10 is designed with the latest in technological innovations and SIA is proud to be the launch customer for this newest and largest variant of Boeing’s Dreamliner family,” said Singapore Airlines CEO, Mr Goh Choon Phong, who travelled on the delivery flight from North Charleston. SIA is the largest customer for the 787-10, with firm orders for 49 of the type. The Airline also has a firm order with Boeing for 20 777-9s, which are due for delivery from the 2021/22 financial year.